Shopping for a new INFINITI Q50? Don’t stray far from base. The 2019 Infiniti Q60 is a better value in Pure or Luxe trims. Fierce competition has left a bevy of good compact luxury car choices for shoppers like the 2019 Infiniti Q50. This year, the Q50 is available in a pared-down roster of trims: the base 2.0-liter turbo-4 is only available in Pure trim; the 3.0-liter turbocharged V-6 is reserved for Luxe, Sport, and Red Sport trims. A slow-selling Q50 Hybrid was shelved this year. Regardless of what’s underhood, the Q50 is sharp and muscular in its appearance, punctuated by an updated interior that’s the right side of understated without being boring. Top trims get dressier leather that looks good (and feels good) although their prices may be a stretch compared to others in the class. The Q50 mostly outpoints those competitors, short of fire-breathing Ms and AMGs with unlimited budgets. The base turbo-4 makes 208 horsepower that outguns budget BMWs and Audis. The V-6 returns 300 hp in Luxe and Sport trims, 400 hp in Red Sport guise that’s hugely satisfying if you’re one of the many luxury compact sedan owners who never visits a track. All-wheel drive is available on any powertrain for a $2,000 upcharge. A 7-speed automatic transmission is standard on all models. Unlike the Q60 coupe, the Q50 sedan has a real backseat for real adults, although we’d choose to ride up front for its all-day comfortable seats. The Q50 lacks safety data, but all models are equipped with forward-collision warnings with automatic emergency braking. Blind-spot monitors and active lane control are available as optional extras. Base versions are better values: The Q50 Pure gets 17-inch wheels, LED headlights, synthetic leather upholstery, power-adjustable front seats, dual touchscreens for infotainment, Bluetooth connectivity, and two USB charge ports for $36,845. The dual-screen infotainment system isn’t our favorite; we’d trade two touchscreens for one with Apple CarPlay and Android Auto compatibility instead. Sharp and athletic, the 2019 Infiniti Q50 is handsome among its rivals. One year removed from a slight update, the 2019 Infiniti Q50 still rings the bell as one of our favorite luxury compact sedans on the road. The exterior of the Q50 is punctuated by a sharply creased hood up front and exaggerated haunches in back. A revised front bumper opens wide at the bottom, swallowing up road and spitting out wonderful exhaust notes from the dual tailpipes. Pure and Luxe trims get lashings of chrome outside, while the Sport and Red Sport heap on black trim accents for a more menacing look. The cabin received the lion’s share of the makeover last year. The Q60’s thin steering wheel and stitched dash are nice touches. Top trims get quilted leathers that look handsome in black, one of the few cars on the road that looks better with a darker trim. Infiniti’s dual-screen infotainment system still dominates the dash, but it’s a sin that every other automaker commits already. The 2019 Q50 keeps pace with the bigger guys, aided by a twin-turbo V-6 that’s entertaining in both specs. Infiniti offers a typical roster of powertrain options for the 2019 Q50, albeit delivered in surprising ways. The turbocharged V-6 makes 300 hp in Luxe and Sport trims, and is boosted up to 400 hp in Red Sport versions. 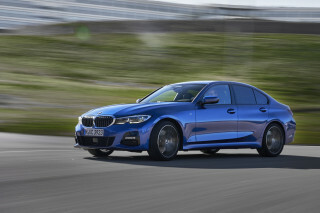 The former takes on near-performance competitors like the Mercedes-Benz AMG C43 and BMW M340i, while the latter tempts full performance buyers unconcerned with lap times for less money. Most of our turns were behind the wheel of V-6-equipped models. Power is effortless across the rev range, and the turbo wall of torque can be intoxicating. 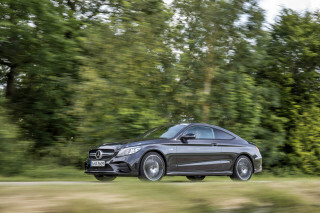 Rear-wheel drive is standard on all models, and all-wheel drive is a $2,000 upgrade. Infiniti’s all-wheel-drive system is seamless and sharp and carves a tighter line through canyon roads. Adaptive dampers are standard on Sport and Red Sport trims, but the standard steel springs on base trims are fine by our backsides. Infiniti offers a steer-by-wire system that, thankfully, is optional. The trick system is the same used in the Q60 and it lacks the feedback that we’d like to feel from a sporty compact luxury sedan. The system replaces a traditional mechanical connection with a series of motors and force actuators that translate steering wheel input into the front wheels. Removing most of the hardware sheds weight and makes active lane control easier, but the steering wheel is largely disconnected from the front axle. Skip it for now, but we expect that Infiniti will fit the system to more models in the future. Good space is made better by efficient and comfortable seats in the 2019 Infiniti Q50. The 2019 Infiniti Q50 gets a little help from an unlikely source to make it a comfortable luxury sedan. Corporate-parent Nissan’s so-called “Zero Gravity” seats are optimized for better ergonomics without more bulk or extra padding. The benefit is two-fold: The front seats are more comfortable than some rivals, and they don’t eat into rear seat leg room. Stepping up to Sport and Red Sport trim levels add soft leathers that are attractive and supple. Rear-seat riders get 35.1 inches of leg room, which is enough for taller passengers, although the head room may be cramped for long torsos. The rear seat should be fine for two adults, or three for busy office lunch runs. The rear seats closest to the doors have more sculpting and are comfortable for the class, but the Infiniti lacks rear-seat USB chargers. The trunk offers 13.2 cubic feet of cargo room, which is on par for similarly sized sedans. Fit and finish in the Infiniti Q50 is up to snuff, by luxury-car standards. Top trims get soft aniline leather seats, but come bundled in pricey trim packages that may be tough to justify. The Infiniti Q50 lacks a complete set of crash-safety scores. Unlike some of its competitors, the Infiniti Q50 is equipped with forward-collision warnings with automatic emergency braking as standard equipment. Blind-spot monitors, active lane control, adaptive cruise control, and rear automatic emergency braking are available on V-6-equipped models for an extra cost. Outward vision in the Q50 is mostly good, thanks to Infiniti’s push for bigger and brighter cabins with more glass. Base versions of the 2019 Infiniti Q50 are well-equipped, but top trims skip a few common-sense features. The 2019 Infiniti offers an impressive list of standard features for its sedan, a rare (relative) value among luxury cars. The Q50 comes in Pure, Luxe, Sport, and Red Sport trims. 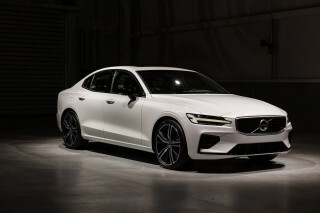 Base sedans are equipped with 17-inch wheels, LED headlights, synthetic leather upholstery, power-adjustable front seats, dual touchscreens for infotainment, Bluetooth connectivity, two USB charge ports, and forward-collision warnings with automatic emergency braking. 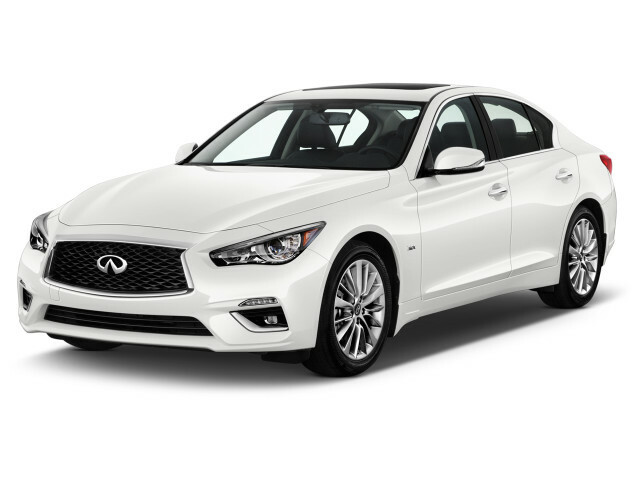 The 2019 Infiniti Q50 Pure costs $36,845, including destination fees. Adding all-wheel drive to those versions adds $2,000. 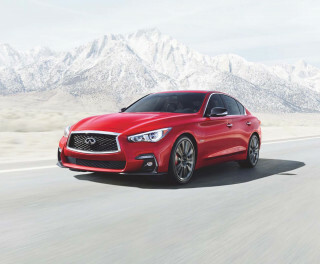 At the other end of the lots are the 2019 Infiniti Q50 Red Sport, which is equipped with an adaptive suspension, uprated brakes, 19-inch wheels, leather upholstery, heated front seats, a heated steering wheel, navigation, and rear parking sensors. The top-of-the-line Q50 Red Sport costs $52,295 (all-wheel drive is $2,000 more) and skips premium audio or memory settings for the driver’s seat. That’s why we think there’s better value near base versions. If a V-6 is a must (and we must, sometimes) the Q50 Luxe is a smart pick for $39,595 to start. Those versions are equipped with 18-inch wheels, synthetic leather upholstery, and the dual touchscreen infotainment system. We have our reservations with that infotainment system, we admit. The dual screen layout can be confusing, and most other automakers have skipped it for a reason. Some functions appear to be duplicated among both screens, including vehicle information and setup, and the bottom screen looks better than the top screen in the Infiniti. We’d be willing to trade two screens for just one with Apple CarPlay or Android Auto compatibility, which Infiniti doesn’t offer in the Q50. The Infiniti Q50’s turbocharged powertrains deliver fun and respectable fuel economy. Without a hybrid version for 2019, the Infiniti Q50 is about average for fuel efficiency. Good news: Opting for a V-6-powered Q50 doesn’t significantly dent fuel economy. 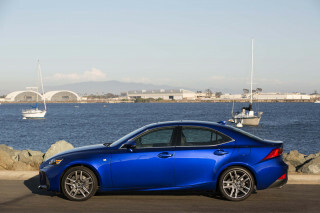 The EPA rates the V-6 and rear-wheel-drive sedan at 20/29/23 mpg. Fitting all-wheel drive to any version largely shaves 1 mpg, across the board. The higher-power Q50 Red Sport rates 20/26/22 mpg or 19/26/22 mpg with rear- or all-wheel drive, respectively. All versions of the Q50 are rated for premium fuel. Most versions of the Mercedes-Benz C300 rate 25 mpg combined or better, and the Volvo S60 rates 25 mpg combined with all-wheel drive. Looking for a different year of the INFINITI Q50?